For a large number of PC users, Synology represents the gold standard in network-attached storage (NAS). The Taiwanese company, founded in 2000, has in recent years raised the bar for NAS solutions and developed a portfolio of award-winning products running the popular DiskStation Manager operating system. 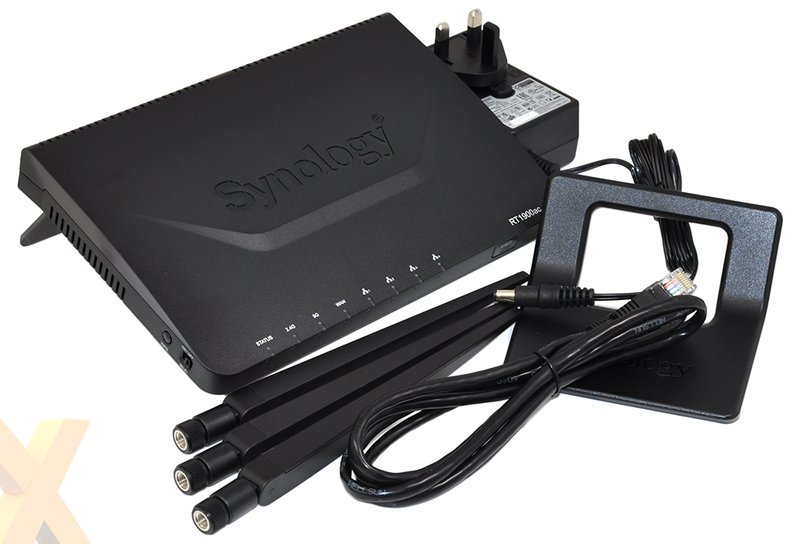 It's a tried and trusted solution, so when Synology announced its intention to branch out and launch a router, we paid attention. The goal, it seems, is to present a home/office router capable of providing the reliability and quality user experience we've come to expect from a Synology device. To find out whether or not it delivers, we have the firm's first-ever router in for review, the RT1900ac, available for £120. The price is competitive for a modern router touting simultaneous dual-band WiFi, and first impressions mirror that of a Synology NAS. The RT1900ac is business-like in terms of appearance, and that extends right throughout the packaging and bundled documentation. There are no frills and rightfully so - this is a router, which in itself is a workmanlike device that should carry out its tasks without requiring much attention. Build quality is satisfactory, with Synology using sturdy plastics that exhibit little to no flex, and the underlying specification serves up no major surprises. For those who prefer to pore over the finer details, the RT1900ac is making use of a dual-core ARM Cortex A9 processor partnered to 4GB of flash storage and 256MB of DDR3 memory atop a Broadcom BCM58622 chipset. It's a neat little box, though as is the case with most high-performance routers, the large high-gain dipole antennae are an eyesore and don't quite blend in to the environment. Synology's trio attach easily and rotate to just about any angle, and as the model number suggests, speeds of up to 1,900Mbps are supported. This is wireless networking, mind, so take the theoretical possibilities with a pinch of salt. What we're really looking at here is up to 600Mbps on the 2.4GHz band and up to 1,300Mbps on 5GHz. A series of status indicators line the front of the device, where you'll also find an eject button that works in unison with the USB 3.0 port on the right-hand side. There's also a handy SD-card slot, and on the other side you'll find a hardware toggle switch for WiFi broadcasts as well as a customary WPS button. Vents are plentiful and we were pleased to discover that the unit didn't get particularly hot during testing. Along the back of the device is a power switch, a connector for the external supply, and then single WAN and quadruple LAN, all of the Gigabit variety. 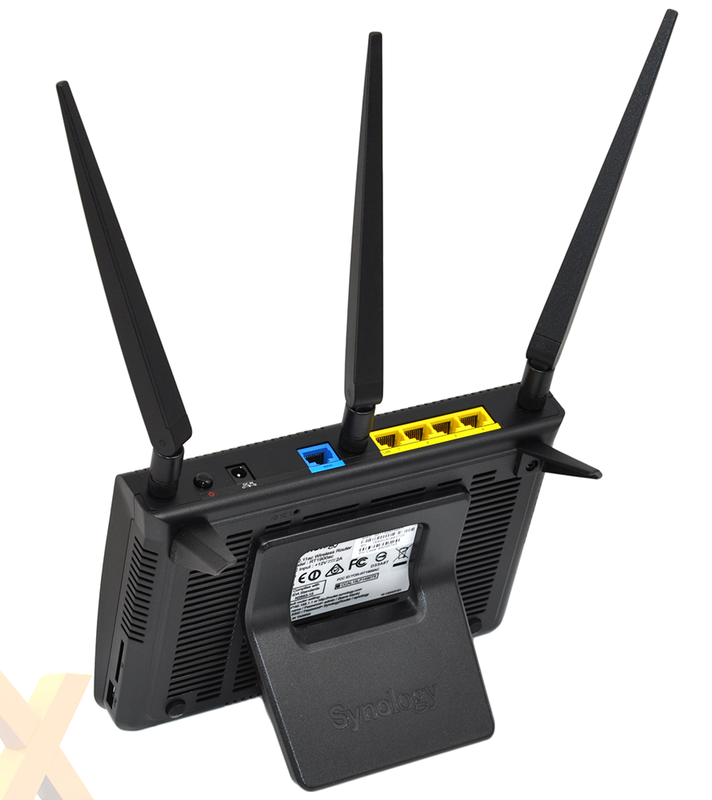 What's interesting is that the router is raised in its out-the-box state via two rear feet, but Synology also includes an optional stand (pictured above) that can be used to further elevate the device. The supporting documentation encourages the use of this stand to enhance wireless coverage, but the optional accessory does have an unwanted drawback in that it leaves the LAN ports pointing upwards, resulting in visible cables and unwanted clutter. 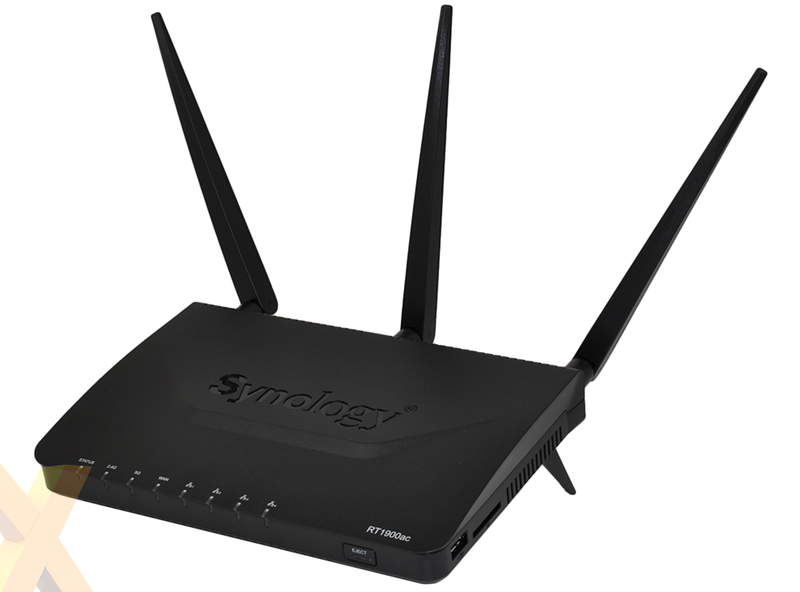 Synology has covered most of the essentials from a hardware perspective, but it has kept things simple and we were disappointed to learn that there isn't an RT1900ac model outfitted with a built-in ADSL/VDSL modem. Having to attach an external modem adds an extra layer of complexity that we would rather avoid, and as far as hardware is concerned, Synology has played it reasonably safe. That's no bad thing, mind, as plenty of thought has gone into the accompanying software.